Please use this thread to discuss details about ticket sales, travel and more regarding the Rolling Stones Tour 2015 in Indianapolis. 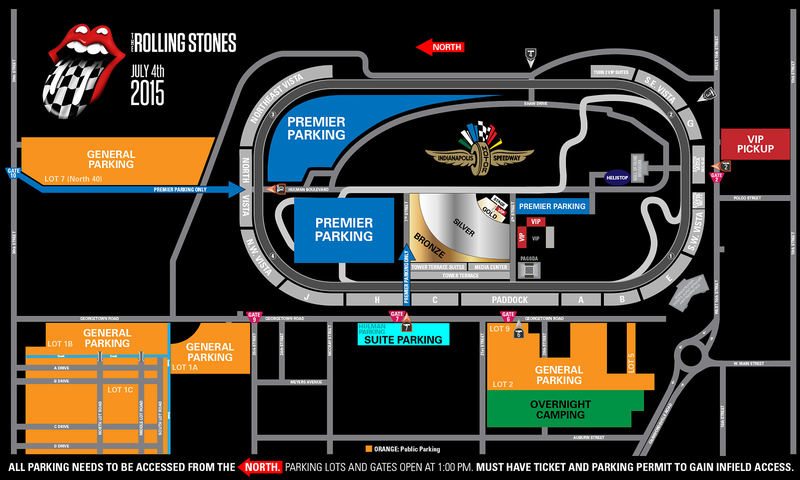 I know it doesn't apply to everyone, but here is the layout for Indianapolis since so many people were curious. $77 for Bronze, $119 for Silver, $302 for gold and $995 for VIP. Link to IMS' website which is now updated with a ton of info and a link on there to sign up for their presale. Also if anyone is not from the area, I can do my best to help with questions. Lived in Indy my whole life and spend way to much time at the Speedway. Edited 1 time(s). Last edit at 2015-03-31 17:37 by jboug44. its sort of hard to get a sense of scale from the graphic. do you think "silver" ticket holders will be significantly worse off than "gold?" It will depend a lot on where in silver you are. From 6th street to 7th street ( street to the right of the stage going left to the next street) is almost 1500 ft in distance. That can give you a general idea of how large the area is. My humble opinion is if you are the middle of silver or closer, you should be fine, and it'll justify the price. Is this area of the field sloped at all or is it totally flat? It's flat. It's actually half asphalt lot, half grass used for parking for the races. They've never held a concert at the this part of the track ( to my knowledge) but they've always made shows work at the track regardless of where they are so they should have a really good plan here again. As a born and raised Hoosier, who hasn't lived there in a long time, I'm happy Indy is hosting this rather large concert event. Hopefully the stink from recent political events there will have passed by then. I'm interested to hear what they say. They always let people tailgate in the infield but yet it says this on the website: "The Rolling Stones concert will be standing room only so coolers and lawn chairs will not be allowed into the Indianapolis Motor Speedway". I can't image they would open the parking at 1 P.M. and not allow people to bring any food or drink for a show that doesn't start until 7 hours later. I for sure wouldn't go any worse than Silver. 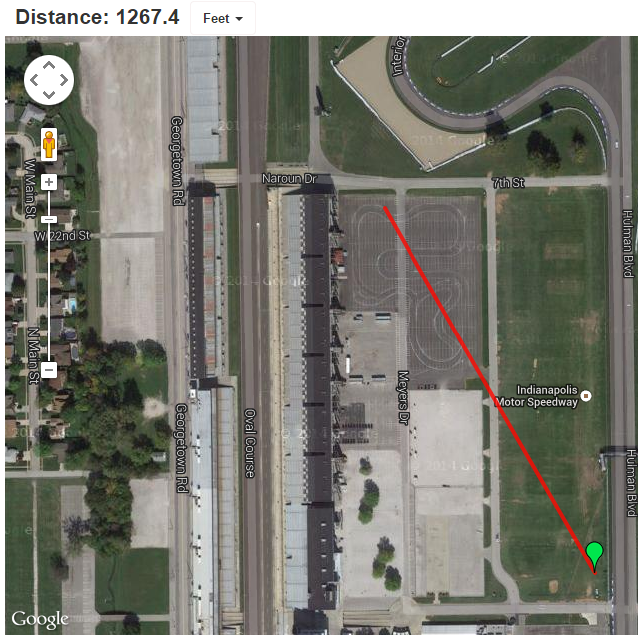 I used a running app and it says its over 1200 feet from stage corner to the far back of bronze. Does it really matter how far away you are? Only the super duper golden areas up front can see them anyway. They're old as dirt now. Who needs to be close up? As long as the sound is good, just go for the fireworks and the special effects. It's not like they'll be any surprises. The music is secondary in these stadium shows to the spectacle itself. I can't wait for this! I live in Indy! And my wife works for the newspaper & is getting 2 media passes! One is hers and the other is MINE! Last time the Stones were in Indianapolis was '94 for Voodoo..glad they will be here again finally! and save us the trip to driving to Chicago like we did last yr. For Show #2 @ The Inited Center! Care to share? I was there in '94 too and 20 years older as well (with kids) and would much rather they played Lucas or Conseco (or the fairgrounds) than fight crowds of drunken slobs. I'm a little confused by this setup. How much of it is General Admission? They expect thousands of people to fight for their little plot of land as if it was some hoaky 1970s concert? I don't live in Indy anymore. Is this the first concert at the track? I'm also a life long Indy resident and very excited about this. Saw them in Indy for Steel Wheels in `89 and Voodoo in `94 and went to the race and qualifications every year for over 20 years. I would have also preferred to see it at Lucas Oil, but the track is iconic and unique, so what the heck! It's funny thinking about how the Buffalo people were talking about how they have the best tailgating area - the 'camping' (partying) areas around the IMS will make their tailgates seem like a cub scout meeting! My guess is that tailgating and coolers will be OK in the parking areas, but they won't allow coolers inside the concert area. Is there any chance there will be warm up bands? That is a huge area for a concert. Indy is a fun place and very well run. I went to every Formula 1 race at Indy in the 2000s. They know how to handle crowds. However, with all sections being standing room only, and being so huge, I think I'll pass on this. Ohio Stadium - the entire structure, which seats 105,000 in the stands for football, would easily fit within that area, with a fair amount of extra space at the north/south ends. Hard to believe they will come close to selling out those flat sections at those prices. I'm sure they won't - there will be massive flex type pricing and/or something similar to the 2013 $85s (at much lower prices) to fill that area. Edited 1 time(s). Last edit at 2015-04-01 07:00 by IGTBA. Can you imagine sitting outside in the broiling July 4th sun in Indy? Without a chair to sit on? I thought these kind of concerts were forbidden now. I still remember the 'festival seating' disaster in Cleveland in '78. Kind of funny. It sounds like only the young could stand to be at this Stones concert now. And people are going to pay $300 and up to STAND in the Gold Section? Suckers. Impress your guests when they enter these luxury suites at the Indianapolis Motor Speedway. You and your guests will enjoy spectacular hospitality during The Rolling Stones concert and July 4th festivities. Would be cool if they could add balconies on the back side of the Tower Terrace suites. "A yet-to-be announced supporting act will perform at 8 p.m"
Melissa from IMS returned my call today. She informed me that you will be permitted to tailgate in the infield in the premium parking areas. No grills or open fires allowed. Pop up tents allowed in your space only. Looks like this will be a epic tailgate experience. Entrance to infield 1pm. Stones start @ 930. Fireworks after show. Does anyone know yet what comes with VIP tix if anything? And do we know yet if there are seats in the VIP and Gold sections?